The Bible Challenge is an invitation to journey with fellow believers from across the world and across the Anglican Communion through the entire length and breadth of the Bible, and to experience the full sweep of the biblical record in the course of a single year. For each of 365 days, there is a selection of readings comprising Old Testament, Psalm and New Testament passages, insightful commentary by one of a hundred theologians and church leaders from around the Anglican Communion, a prayer for the day and questions for reflection. UK contributors include: Nick Baines, Rosalind Brown, Jeffrey John, Archbishop Barry Morgan, Mark Oakley, June Osborne, Martyn Percy, Emma Percy, Michael Perham, Stephen Platten and others. 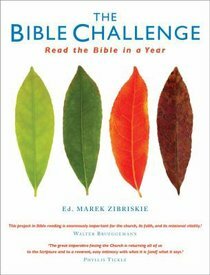 The Bible Challenge is supported by a website www.thecenterborbiblicalstudies.org and its international advisory board includes Rowan Williams, Paula Gooder, David Ford, Graham Tomlin and many senior figures from around the Anglican world.